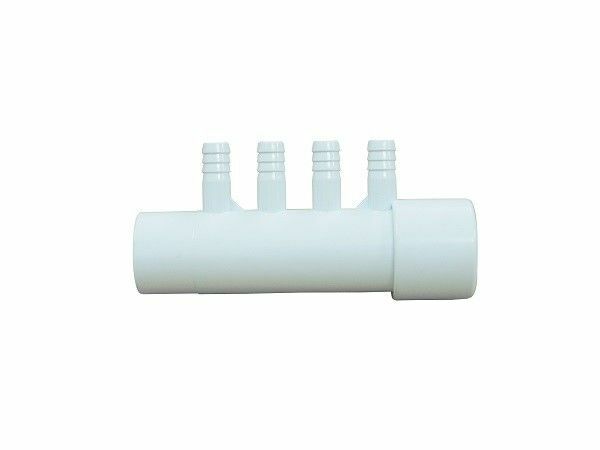 4-port manifold with (4) 3/8" barbs and 1" S x 1" SPG inlet/outlet. The Hot tub Spas air manifold recieves a 1"ID or 1 5/16" OD pipe on one side and then slips into a 1 5/16" ID fitting on the other side with (4) 3/8" Barb Fittings. NOTE: 1" in PVC Plumbing actually reads 1 5/16" on the outside of the pipe and 1" on the inside Diameter of the pipe. You can put this with other manifolds we are offering to make up the size manifold you need or choose a Kit that includes an Air Valve, Manifold, Barbed couplers and more. Air system manifold are used for blowers, bubblers & Venturi's etc... available in PVC plumbing sizes 1/2", 3/4", 1" & 1.5" PVC all with barb fittings. The barbs are usually 3/8" dia. for standard vinyl air tubing.